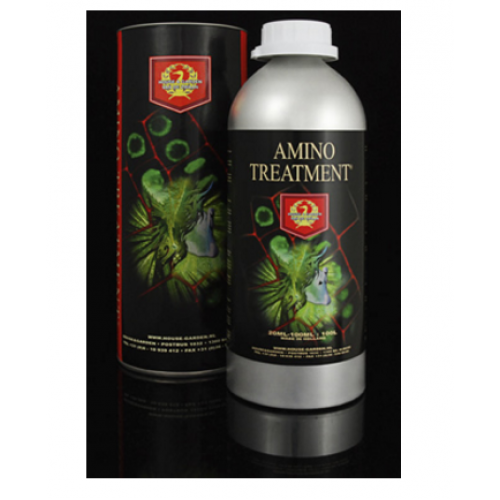 House and Garden Amino Treatment have set the standard worldwide. This revolutionary product will produce an abundant fruit crop, rich in both quality and quantity. The amino acids in this treatment will help to boost the chlorophyll levels in your plants which increase the level of photosynthesis and produce a lush green harvest. With Amino Treatment your crop will a higher level of sugar, a solid green stem, strong roots and an overall increased distribution of foliage. This treatment is preferred by both professional and private gardens and is quickly becoming one of the most popular plant treatments. Using Amino Treatment guarantees abundant growth and explosive flowering of your plants. After many years of research, House & Garden presents this revolutionary growth and flowering booster. It’s an entirely new product, containing a well balanced combination of active ingredients. Directions for Use: Mix 2 ml per liter and add to the water system from the second week up to about 3 weeks prior to harvest. Adjust levels according to the label per specific vegetation and conditions. House and Garden Aqua Flakes A&BHouse and Garden Aqua Flakes A&B is suitable for both grow a..
House and Garden Coco A&BHouse and Garden Coco A&B is suitable for both grow and bloom!House..
House and Garden Soil A&BHouse and Garden Soil A&B is suitable for both grow and bloom!This ..
House and Garden Bud XL House and Gardens unique product Bud XL has the capability to extract s..
House and Garden MultiZymeThis revolutionary growth stimulator is rich in vitamins, coenzymes and en..